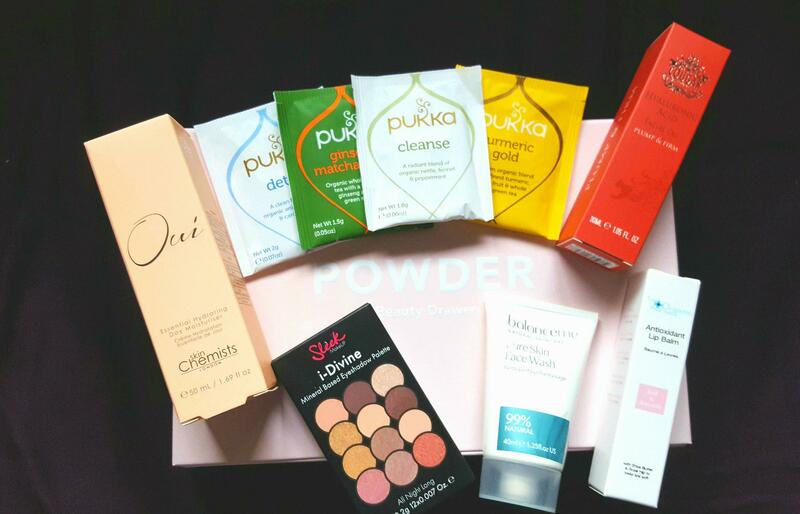 January is traditionally a detox month (I started in December to try and get a head start) and the Powder Detox Box is packed with a mixture of full and sample sized products to help your skin and body survive a chilly winter. Housed in a very useful pink drawer box, the one off box (while stocks last) has a retail value of over £130, and costs £50 plus £3.50 postage. Use the discount code DETOXPOW to get £12 off the box! Approximate retail value of £130 (based on RRP from brand websites at the time of writing). 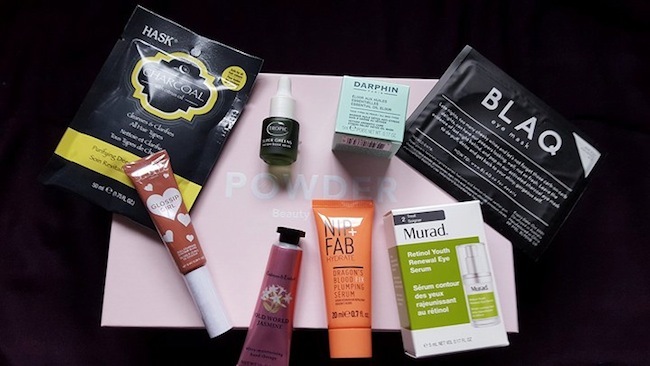 Recently I’ve struggled to find any beauty boxes that I have liked in terms of content and value, and I’m glad to have found one this month where I can use more than 50% of the contents. 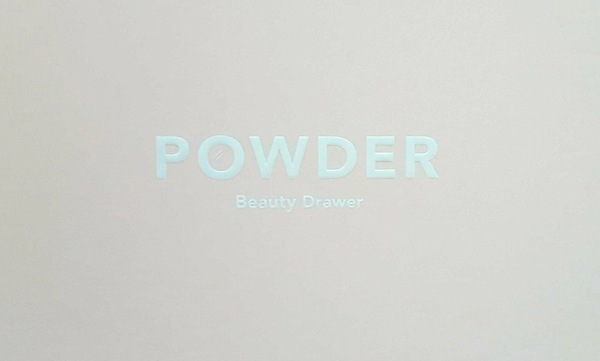 Powder boxes generally have several full sized items (there are 6 in this box), which makes it better value than other beauty boxes that tend to offer only sample or travel sizes in their boxes. This is an ideal box for someone looking for a new skincare routine, or who wants to try some new skincare items for the year. Most products will last 6-8 weeks, so this is a good investment for those who need to update their beauty cabinet. My picks and finds from the box are; Darphin Vetiver Aromatic Care Stress Relief Detox Oil Mask, despite the long name, the French skincare house never fails to impress me and this gel cream mask is so easy to apply as it glides on, smells relaxing, and leaves the skin looking and feeling refreshed. I just wish the size included was a little bigger, and this is also a newly launched product. Murad is another brand that has impressed me recently, and the Murad Retinol Youth Renewal Eye Serum is another star item. The eye serum is concentrated and the pump dispenser makes sure you only use a small amount. Everyone needs an eye product whatever your age, as the skin around the eye area is so fragile and adding an extra boost to it will help keep any fine lines at bay. Crabtree and Evelyn Ultra Moisturising Hand Therapy was a nice surprise as it really is a rich and non-greasy hand cream and the scent was so subtle, it wasn’t overpowering how some creams can be. I’m a firm believer in taking care of your hands as they go through so much each day, and this is an affordable luxury for your hands. The Organic Pharmacy Antioxidant Lip Balm was another surprise item that I loved, and contains shea butter, rose hip, and pomegranate; it’s another superb item that hydrates and doesn’t feel greasy, plus smells pretty wonderful without being over powering as well. Cougar Hyaluronic Acid Facial Oil comes as a full sized product and is excellent value in the box. This is a light facial oil which is suitable for all ages and skin types, and is used under a moisturizer to help boost the moisture levels in the skin, and so is great to repair dry, dehydrated, or dull skins. I already use some of the other items in the box such as the Balance Me Pure Facial Wash, which is a gentle wash off cleanser, and Nip + Fab Dragon’s Blood Plumping Serum, a light serum that hydrates the skin. The box has a good balance of skincare, and makeup items in shades that are neutral and that suit all skin tones. I’m also a big fan of eye masks and the Blaq ones are great to try when you have time to relax after a bath or shower. The detox tea is a nice idea, however, I’m not a tea drinker but these are great for people who want to try them out and I can always offer them to guests. Out of the whole box, the only items I won’t be using are the tea bags and the Tropic Super Greens Serum, which didn’t suit my skin (and the smell wasn’t quite to my liking), as I ended up with a small break out. This was a successful box for me, and it’s one of the better curations I have seen for a long time. As I say, a beauty box is only good value if you will use all the products no matter how much you are saving, and when you can use 80%, that’s pretty darn good. 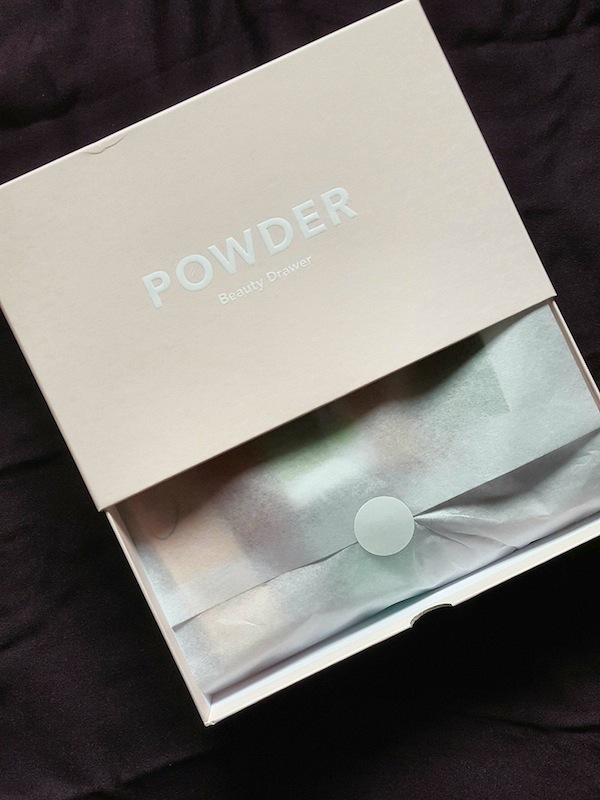 Powder offer one off limited edition boxes and seasonal boxes, each with a mixture of full, sample, and travel sized items. You can buy a Powder box here, and use the code DETOXPOW to get a £12 discount on the Detox Box, postage is £3.50 extra per box. Boxes are available while stocks last, and the sturdy pink drawer boxes are great for storing all your beauty items or in my case to put them in some sort of order.